The Tokyo Metro Hibiya Line is a subway line that runs between Naka-Meguro Station and Kita-Senju Station. 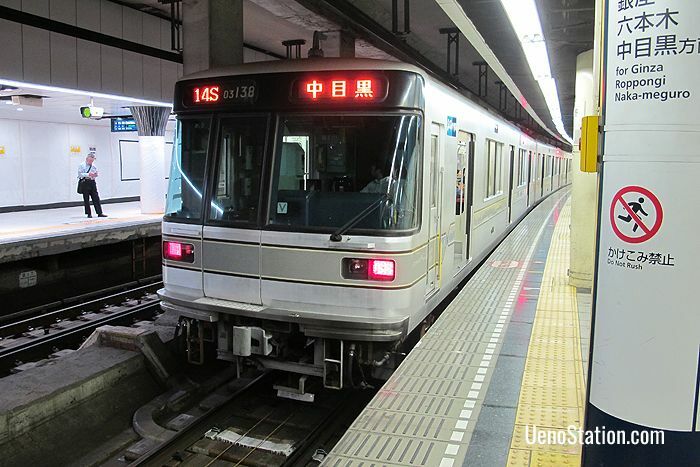 The Hibiya Line is one of 9 subway lines that are operated by the private company Tokyo Metro. Tokyo Metro is one of two underground railway systems in Tokyo. A separate underground railway network is operated by Toei Subway. The Hibiya Line connects some of Tokyo’s most popular districts for shopping, dining, nightlife and other cultural pursuits. These include Nakameguro, Ebisu, Roppongi, Ginza and Akihabara. Within the Tokyo Metro subway system the Hibiya Line is color-coded gray. There are 21 stations on this line. In addition to these stations a new station is scheduled to open between Kamiyacho and Kasumigaseki in time for the 2020 Tokyo Olympics. Many services running from Naka-Meguro are through services that continue beyond Kita-Senju on the Tobu Skytree Line as far as Tobu-Dobutsu-Koen Station. Some through services also continue beyond Tobu-Dobutsu-Koen to destinations on either the Tobu Tobu Isesaki Line or the Tobu Nikko Line. The key destinations on the Hibiya Line are listed below with their transfer points. 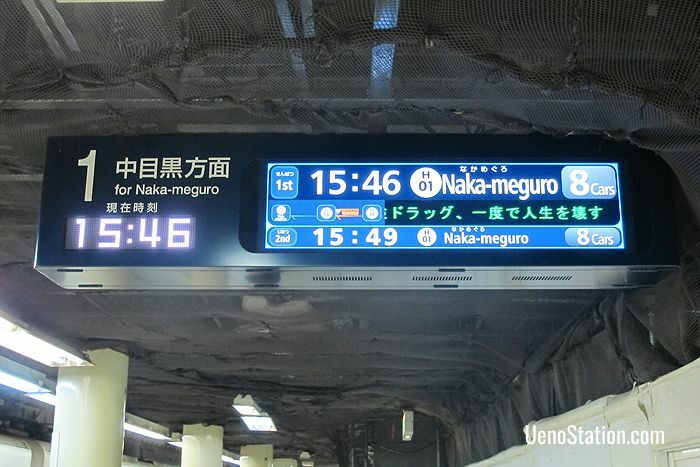 Example train fares and journey times are given from Ueno Station. Nakameguro is a pleasant residential neighborhood with a rich assortment of cafes, restaurants, bookshops, and fashion boutiques. There is also a good selection of galleries and museums within walking distance of the station. Sato Sakura Museum of Art exhibits contemporary Japanese style Nihonga paintings. This museum is a 3 minute walk from Naka-Meguro Station. Kyu Asakura House is a historic house and garden dating from 1919 which is open as a museum. This fine example of traditional Japanese architecture is an 8 minute walk from Naka-Meguro Station. The Museum of Contemporary Sculpture is a 16 minute walk south of Naka-Meguro Station. Meguro Museum of Art is a gallery of contemporary Japanese art which is a 17 minute walk south of Naka-Meguro Station. Meguro Sky Garden is a large rooftop garden with over 1,000 trees, flower beds, and lawns. The garden has good views over the city and if the weather is clear it is possible to view Mount Fuji. Meguro Sky Garden is free to enter and a 16 minute walk northwest of Naka-Meguro Station. Baird Beer Taproom is just a 3 minute walk from Naka-Meguro Station. Here you can try a great selection of tasty craft beers along with some crispy New Haven-style pizza. The Meguro River which runs through this neighborhood is lined with cherry trees and is a popular cherry blossom viewing location in the spring. Transfer at Naka-Meguro Station to the Tokyu Toyoko Line. Ebisu is a popular area with a great variety of restaurants, cafes, and bars. The biggest attraction here is Yebisu Garden Place. This is a large commercial complex built on the site of the former Yebisu Beer brewery. Inside there are a large number of shopping and dining facilities, a cinema, the Museum of Yebisu Beer, and the Tokyo Metropolitan Museum of Photography. Rising above these facilities is the Yebisu Garden Place Tower, a large skyscraper with restaurants on its 38th and 39th floors from which diners can enjoy stunning views over the city. Yebisu Garden Place is 5 minutes from Ebisu Station via the Ebisu Skywalk moving walkway. Art lovers should walk north to Yamatane Museum of Art which exhibits contemporary Japanese oil paintings and watercolors. The museum is 11 minutes from Ebisu Station. Liquidroom is a popular live music venue with an onsite gallery and café lounge which is just 4 minutes’ walk north of Ebisu Station. Transfer at Ebisu Station to JR East’s Yamanote Line, Saikyo Line, and Shonan-Shinjuku Line. Hiroo is an upmarket residential area which is especially popular with expatriate professional workers in Tokyo. There are a number of foreign embassies in this district and the area around Hiroo Station has a lot of cafes and restaurants. Arisugawa-no-miya Memorial Park is an expansive area of parkland with woods, streams and waterfalls, which is a 4 minute walk east of the station. Azabusan Zenpukuji Temple is a 16 minute walk to the east of the station. Established in 824, this is one of the oldest temples in Tokyo. A large 750 year old gingko tree on the temple grounds is a registered National Natural Monument. Hiroo Plaza is a stylish shopping complex just 3 minutes south of the station. Roppongi is a lively international district with large upmarket commercial developments such as Roppongi Hills and Tokyo Midtown. Roppongi is also famous for its nightlife and has a large number of bars, pubs, restaurants, and nightclubs. Popular nightlife locations are the Hobgoblin British-style pub, craft beer bar Brewdog Roppongi, the New York style bar Wallstreet Café, live music venues such as Kento’s and Billboard Live, cabaret bars such as Burlesque Tokyo and Tantra, and clubs like A-Life and V2. Izumi Garden Tower is a high rise commercial complex with a large selection of shopping and dining facilities. Roppongi Hills is a large scale development complex which includes shops, restaurants, a hotel, a movie theater, and a museum, as well as offices and apartments. At the center of the development is Mori Tower which stands 54 stories and 238 meters high. Mori Art Museum is located inside the Mori Tower and there is also an observation deck from which to enjoy a panoramic view of the city. The Grand Hyatt Tokyo is a luxury hotel located inside Roppongi Hills. The hotel’s facilities include ten restaurants and bars, a spa and fitness center, an indoor swimming pool, and a stylish interior decorated with over 200 artworks. Tokyo Midtown is another large commercial complex comprising six main buildings with the Midtown Tower as its centerpiece. This mixed facility skyscraper is 54 stories and 248.1 meters high and includes offices, apartments and on its 5th floor the innovative Tokyo Midtown Design Hub gallery. Other buildings have a great variety of shops, restaurants and cafes and are surrounded by gardens and parkland. Suntory Museum of Art is located in the Galleria building and exhibits paintings, ceramics, lacquerware, glassware, and other arts and crafts. The Ritz Carlton Tokyo is a 5 star hotel located on the upper floors of the Midtown Tower. This hotel has three restaurants, a lobby lounge and bar, a spa and fitness center, and guest rooms with some of the best panoramic views in Tokyo. The National Art Center, Tokyo (NACT) is a large exhibition space which is also located in Roppongi. As well as hosting a large variety of temporary exhibitions the NACT also has a shop, a restaurant and three cafes. Transfer at Roppongi Station to the Toei Oedo Line. There are several attractions in the area around Kamiyacho Station and one very famous hotel. NHK Museum of Broadcasting has exhibits dedicated to the entire history of broadcasting in Japan with microphones, cameras, and other broadcasting equipment on display. The museum is just 6 minutes’ walk from Kamiyacho Station and entry is free. Sen-Oku Hakukokan is a museum which exhibits items from the Sumitomo family collection. This includes Chinese bronze vessels and mirrors, Chinese and Japanese calligraphy and paintings, Western-style paintings, modern ceramics, Japanese tea utensils, Noh masks and costumes. The museum is a 7 minute walk from Kamiyacho Station. Musée Tomo is a contemporary Japanese ceramics museum that houses the collection of Madame Tomo Kikuchi. The museum is an 8 minute walk from Kamiyacho Station. Tokyo Tower is a TV and radio broadcasting tower that is 332.9 meters high and the second-tallest structure in Japan (the tallest is Tokyo Skytree). The tower has two observation decks that are open to the public and a number of other attractions on the lower floors including shopping and dining facilities, a theme park dedicated to the manga comic One Piece, and an aquarium. Tokyo Tower is a 9 minute walk from Kamiyacho Station. Atago Jinja Shrine is a 9 minute walk from Kamiyacho Station. This hill-top shrine was established in 1603 and is famous for its steep steps. People pray here for success in business and for promotions. Hotel Okura is one of the most famous luxury hotels in Tokyo. Built in 1962 to a design by the architect, Yoshiro Taniguchi, there was a global outcry when the historic main building was demolished in 2015. However, the new main building is being designed by the first architect’s son, Yoshio Taniguchi, and his plans include the recreation of a great deal of the original interior details. The new main building will open in September 2019 and be rebranded as The Okura Tokyo. Until then the south wing of the hotel is still open for business. Hotel Okura is located 10 minutes from Kamiyacho Station and 3 minutes from Musée Tomo. Transfer here to the Tokyo Metro Marunouchi Line and Tokyo Metro Chiyoda Line. Exit here for Hibiya Park. This large public park was first opened in 1903, and includes lawns, trees, flowerbeds and fountains. Also on the grounds are two open air music halls, a museum and library, a public hall, restaurants, and tennis courts. There are also a number of theaters in the Hibiya district. Nissay Theatre is a more conventional establishment that stages productions of kabuki, opera, musicals, and puppet shows for children. The Takarazuka Theatre stages all female-cast productions of colorful musical melodramas. The Imperial Hotel is a legendary luxury hotel which was first established in 1890 and is located just 7 minutes’ walk from Hibiya Station. Transfer at Hibiya Station to the Tokyo Metro Chiyoda Line and the Toei Mita Line. Transfer at nearby Yurakucho Station to the Tokyo Metro Yurakucho Line, and JR East’s Yamanote Line and Keihin-Tohoku Line. Ginza is Tokyo’s most famous shopping and entertainment district. Here you will find upscale department stores selling luxury brand goods and many gourmet restaurants, sophisticated bars, art galleries, and theaters. Transfer at Higashi-Ginza Station to the Toei Asakusa Line. Tsukiji’s famous wholesale fish and seafood market closed on October 6th 2018 and its operations were relocated to Toyosu. However, Tsukiji’s outer retail market remains open and here you can still find stores selling kitchen utensils, restaurant supplies, seafood, groceries, and a lot of sushi restaurants. Also nearby is Tsukiji Honganji Temple, a grand structure built in the style of Southern Asian temples between 1931 and 1934. Though this building is modern, a temple has stood here since 1617. Transfer here to the JR Keiyo Line. Transfer here to the Tokyo Metro Tozai Line. There are a lot of traditional shops and restaurants in the Ningyocho area, particularly on the old shopping streets of Ningyocho-Dori and Amazake-Yokocho. Many shops sell sweet ningyo-yaki cakes – a traditional snack in this area. Look out for the two mechanical clock towers on Ningyocho-Dori. As the clocks chime the hour, little dolls shaped like firefighters and rakugo storytellers appear and put on a free show. Check the official Ningyocho website for local recommendations. Transfer here to the Toei Asakusa Line and at nearby Suitengumae Station to the Tokyo Metro Hanzomon Line. The Akihabara district is a famous commercial district with many wholesale stores selling cheap electronic and computer goods. Akihabara is also famous as a center of otaku culture with many shops selling manga comics, games, toys, cosplay costumes, and anime-related goods. This station is convenient for Yoshiike department store, the Matsuzakaya department store, and Japan’s oldest discount store, Takeya. There are three more stations close to Naka-Okachimachi station. Transfer at Okachimachi Station to the JR Keihin-Tohoku Line. At Ueno-okachimachi Station transfer to the Toei Oedo Line. At Ueno-hirokoji Station transfer to the Tokyo Metro Ginza Line. Transfer at Ueno Subway station to the Tokyo Metro Hibiya Line, and at Keisei Ueno Station to the Keisei Main Line and Keisei Skyliner. 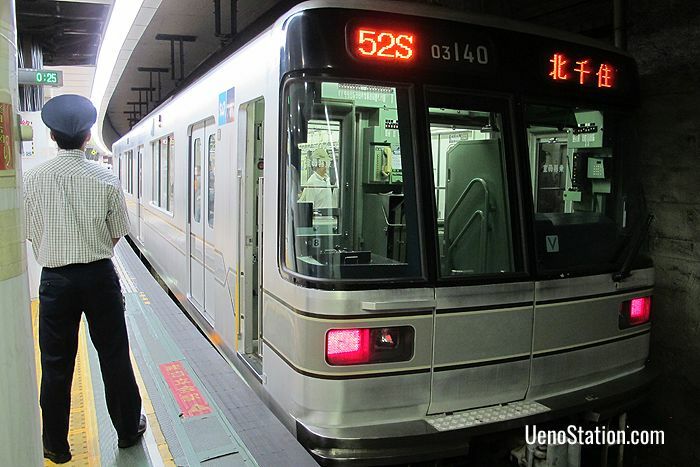 JR Ueno Station is just above the Metro station and here you can transfer to JR East’s Yamanote Line, Keihin-Tohoku Line, Utsunomiya Line, Joban Line, Ueno-Tokyo Line and Takasaki Line. Transfers can also be made here to services on the Tohoku Shinkansen, Yamagata Shinkansen, Akita Shinkansen, Joetsu Shinkansen, Hokuriku Shinkasen, and Hokkaido Shinkansen. The Ichiyo Higuchi Memorial Museum is a 7 minute walk from Minowa Station. Ichiyo Higuchi was a talented short story writer of the 19th century whose face is depicted on the 5,000 yen note. The museum displays various artifacts from her life and is built on the site of her former home. The museum is closed on Mondays or on the following Tuesday if Monday is a national holiday. Transfer at nearby Minowabashi Station to the Toden Arakawa Tram Line. 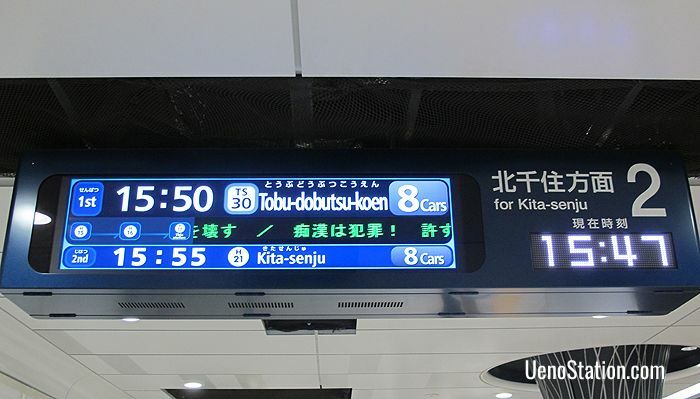 Transfer here to JR East’s Joban Line and the Tsukuba Express (TX) Line. Kita-Senju is a busy commercial district dominated by two large department stores: Lumine and Marui. In the shopping arcades around the station you can find many cheap restaurants and bars. Transfer here to JR East’s Joban Line, the Tobu Skytree Line, the Tsukuba Express (TX) Line, and Tokyo Metro’s Chiyoda Line.